WASHINGTON — President Donald Trump’s former campaign chairman, Paul Manafort, and Manafort’s business associate Rick Gates face decades in federal prison and millions of dollars in potential fines if convicted on all counts in a sprawling federal indictment unsealed Monday. Manafort potentially faces up to 80 years in prison, according to a review of the federal charges and the relevant statutes by The Associated Press. Gates, who also worked for the Trump campaign, faces up to 70 years. Special Counsel Robert Mueller could still file additional charges against the pair. If convicted at trial, the law gives federal judges wide latitude in imposing prison sentences and fines. White-collar defendants often end up serving only a fraction of their statutory maximum sentences, especially if they reach a pre-trial agreement with prosecutors as part of an admission of guilt. 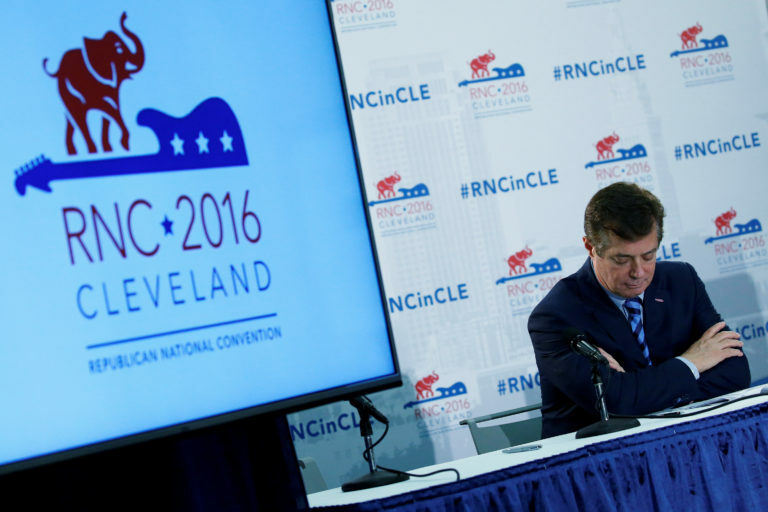 Prosecutors allege that Manafort and Gates worked as unregistered agents of the government of Ukraine and the Party of Regions, a pro-Russian political party led by Victor Yanukovych. While serving as president of the former Soviet republic from 2010 to 2014, Yanukovych was closely aligned with Russian President Vladimir Putin. The indictment says that up to $75 million flowed through overseas accounts controlled by the two Americans. Manafort is alleged to have laundered more than $18 million he used to buy property and goods in the United States. Gates is alleged to have transferred more than $3 million to accounts he controlled. Manafort was released Monday on home confinement after posting a $10 million bond. Gates was released on a $5 million bond. In a separate development Monday, newly unsealed court documents show George Papadopoulos, a former foreign policy adviser to Donald Trump, pleaded guilty on Oct. 5. As part of a sworn statement to the court, Papadopoulos says he repeatedly met in 2016 with Russians offering “dirt” on Democratic presidential candidate Hillary Clinton. Papadopoulos says he then relayed that and other messages from the Russians to senior members of Trump’s GOP campaign. Papadopoulos’ guilty plea came as part of an agreement with prosecutors that signals he could avoid prison time as part of an apparent deal to cooperate with Mueller’s team. Both men are charged with conspiring together and with others to knowingly and intentionally defraud and commit crimes against the United States between 2006 and 2017. If found guilty of this count, each potentially faces up to five years in prison and up to $10,000 in fines. Both men are charged with conspiring together and with others to transfer funds from outside the United States to and through places inside the country without properly disclosing the transactions or paying required federal taxes. Penalties for this count include up to 20 years in federal prison and a fine of either $500,000 or twice the monetary value of the property involved in the transaction, whichever is greater. The indictment alleges that for each calendar year between 2012 and 2015, Manafort failed to disclose to the U.S. Treasury Department that he had a financial interest in and authority over bank accounts in a foreign country involving more than $10,000. Penalties include up to 10 years in federal prison for each of the four counts and fines of up to $100,000, or up to 50 percent of the total value for the transactions, for each of the four years encompassed in the counts. The indictment also alleges that between 2012 and 2014 Gates failed to disclose to the U.S. Treasury Department that he had a financial interest in and authority over bank accounts in a foreign country involving more than $10,000. Penalties include up to 10 years in federal prison for each of the four counts and fines of up to $100,000, or up to 50 percent of the total value for the transactions, for each of the four years encompassed in the counts. Prosecutors allege that both men failed to register with the U.S. attorney general as foreign agents of the government of Ukraine, the Part of Regents and Yanukovych between 2008 and 2014. Penalties include up to five years in federal prison and up to $10,000 in fines. The indictment alleges that both men made multiple false statements to federal officials in relation to their failure to register as foreign agents of the Ukrainian government. Penalties include up to five years in federal prison and up to $10,000 in fines. 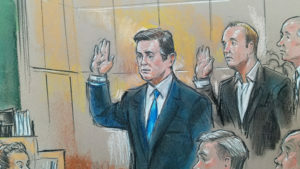 Prosecutors allege that between November 2016 and February 2017 that Manafort and Gates conspired together and caused others to make false statements and conceal crimes against the United States. The penalty for this count is up to five years in prison.